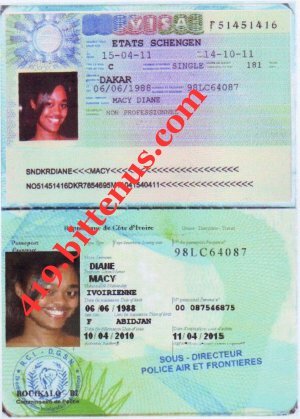 Subject: From blessing. . . . . .
Before i proceed further let me introduce myself fully to you,my name is Miss Blessing Macy Diane 24yrs,5.7ft tall,never married before.i am Ivory Coast by origin but at the moment i am living in Dakar Senegal due to my country problems. I am a girl who loves to give people happiness always despite what the circumstance might look like.most of my hobbies are,reading novels,jogging,listening to news,cooking,listen to music, TV and movies. I like honest,real,sincere and trustworthy people. but i hate dishonest,cheaters, and irresponsible peoples. finally i wish to let you know that sincerely is the best way in life.although we might be thousands of miles away from each other but it does not matter,what really matters in life is love not distance or color. After going through this message,it will be your decision,whether to help me or to leave me to my faith, but whatever you decide bear in mind that i am in trouble and i need your help. I will be so glad if you can allow and lead me to the right channel towards your assistance to my situation.I will make my proposal well known if I am given the opportunity. I would like to use this opportunity to introduce myself to you. His death was very painful to me because, my mother died of heart failure when I was just 6 years old. Since my mother died my father took me so special because I am motherless. When my father was at the point of death at Abidjan Hospital he secretly called me on his bedside and told me that he has a fund of (4.500.000. Four Million Five Hundred Thousand American Dollars) which he deposited in a Government bank in Senegal in the capital territory Dakar, that he used my name as his only Daughter and the person who will inherit the deposited fund in case if he is no more. My fathers death made me to left without parents and his brothers who are my uncles they planed to kill me so that they will take the remaining property of my late parents then I have manage to escape to Dakar Senegal where i am now living in a Catholic Church hostel and where i am seeking my asylum. I went to the bank where my father deposited the money to make the claim of my father fund which is my inheritance so that I can use the money to start up a new life in any country in Europe as you can see my passport with a Schengen visa that i and my father wanted to travel with but he dead on the process. But the bank did not want to grant me access to my fathers money which is my inheritance because of my status , they said that i should present a trustee who will stand on my behalf to make the claims because of my present status and my age, my dear i need you to stand on my behalf as my trustee to make the claims i will prefer if you can come down to Senegal so that both of us will go to the back together. I shall forward to you with the necessary Documents on confirmation of your acceptance to assist me for the transfer and investment of the fund. It is my intention to spend the rest of my life in your country to invest the money. Moreover I am willing to give you 30% of the total sum as compensation for your effort/input after the successful transfer of this money to your account. And you will also help me to invest the remaining 70% into a good business that will profit us in future, Immediately i hear from you concerning my request. I will forward to you all the necessary information' s concerning this deposit Fund so that you can decide whether to come over to Senegal or to contact the bank from your country on the possibility of transferring my inheritance to your care. I am waiting your urgent and positive response. Please do keep this only to your self please i beg you not to disclose this issue to any one till i come over to your country, once the fund has been transferred to your care ,and from it you can send me some little money So that i will buy my air ticket to come over to your country for my New life and please send to me all these information' s below here, which will enable me to introduce you to the bank for them to know whom you are to me before you can come to Senegal or make contact with them on how my inheritance will be claimed. You can call me with this phone number +221773859258 it belongs to the church authority when you call just ask for me they will send for me to talk to you. 2) Your real Nationality or where your leaving right now. 4) Your Age and other important things about you. Compliment of the day, i hope all is fine with you over there if so lets thanks be to God almighty .My dear being a married man will not stop you for helping me ok i will like you to introduce me to your wife all i need is your help then i will repay you as soon as my inheritance is been claimed by you . Thanks for your concern towards my condition i told you about my inheritance that i want it be secured by your help which i wanted you to stand on my behalf as partner and trustee. My dear i do have to put my trust in you because i prayed before coming across your profile and i believe that you will be the one that will help me out of this condition of mine. My dear since you are going to stand on my behalf to make the claims of my inheritance i have to introduce you to the bank for them to know whom you are then you can contact them and as well to ask them the possibility of transferring my inheritance to your care. I will like you to first make contact with the bank where this fund have been deposited, let us hear from them before any other thing will be done, it is due to the trust i have in you that made me to disclose this matter with you, believing that i am save in your hand, no body knows what i have and where i am PLEASE i am asking you for my safety and security KEEP IT VERY PRIVATE ok, i know that God will see us through. Once i get your full information i mean your full name, house address , ID card or passport number, phone number etc that will enable me to write the bank and introduce you to them then i will send the bank contact details to you, so that from there you will make contact with them concerning the account and find out the possibility of transferring this fund into your position ok, i really appreciate your concern, waiting for your urgent response so that we can proceed. My dear i like to hear your voice but i do not have a phone but you can contact me with the Rev,Father' s phone here in the Church Hostel, his number is +221773859258 if you get him just ask of me he will send for me ok.
Again,do attach as you reply to me your full name and full contact information' s such as your full name, house address , ID card or passport number, phone number to enable me write the bank where the money is deposited and introduce you to the bank before you could contact them for the transfer.